All right, let's dig in on these border negotiations with Democratic Congressman Henry Cuellar of Texas. His district sits on the U.S.-Mexico border, and he sits on this conference committee that's trying to find a compromise. We have caught him just off Statuary Hall in the Capitol. Congressman, good to speak with you. HENRY CUELLAR: It's a pleasure. Thank you so much. KELLY: I want to start with how you are feeling about prospects for a deal. I noted President Trump saying he's doubtful a deal will be reached. He said he thinks the chances are somewhere below 50-50. Where do you put them? CUELLAR: You know, I work with our colleagues. We're appropriators. And, of course, we work with our Senate appropriators - Democrats and Republicans. I think appropriators, by nature, are deal-makers. We sit down, and we work things out. So I feel that if there's no outside influence - you know, we're talking about the president - if they just let us do our work, I feel very confident that we can work something out. Nobody wants to see a shutdown. As you know, our position was very simple - keep the government open, pay the employees and negotiate. And that's where we are. We ended up, after a 35-day disaster, back in square one. So we want to negotiate now. KELLY: Well, I mean, you just put your finger on the challenge, which is, it seems, looking at this from the outside, that the biggest issue isn't whether you in Congress can come up with a solution. You did it before with Senator Mitch McConnell's plan. The challenge is coming up with something that the president will sign. Are you any clearer on that today - on what he would accept? CUELLAR: We have no idea. With all due respect to the president, he does change his mind. As you know, originally, back in December, we thought we had a deal. And the Senate had a deal, and we were ready to go with that deal. But then it changed. And all the sudden, he said, no, I want $5.7 billion, and I'm not going to change my mind. And it's still on that. But originally, we, you know, we thought we had a deal. So that's why I feel confident that we can sit down and actually negotiate. KELLY: To drill down on this, are there specific items you want to see on the table in these talks? KELLY: Legal ports of entry, you're saying. CUELLAR: Yeah. Legal ports of entry. CUELLAR: Official crossings. So we put technology - the modern X-ray machines. You look at K-9s. You look at personnel - men and women in blue. And you secure those ports of entry. If you look at the latest drug case in New York, what do they say? Most drugs will come through ports of entry or through fast boats or submarines. So Coast Guard needs to have their equipment, also, to stop those folks on that. KELLY: I guess what I'm driving at is, can you give us any more insight into what exactly the sticking point is at this moment in negotiations? CUELLAR: What the sticking point, I think, at the end is going to be - my opinion - is the president wants a show and tell, which is this, quote, "wall" - fence. That's what he wants. He wants to fulfill a campaign promise. He thinks this 14th-century solution is the best way to secure the border. KELLY: Last thing to ask you, which is this - to what degree hanging over these talks is that the president might decide to bypass you all - to bypass Congress if Congress doesn't give him what he wants - declare a national emergency or just send more military to build a wall? CUELLAR: Well, you know, keep in mind, can he declare? He can. Can he win? Probably not. I mean, there'll be lawsuits everywhere. I mean, notice how he's handled this emergency. If there was an emergency, what do you do? You declare it on the moment. You don't say, let me look at this; let me think about it; oh, I'm going to do this. KELLY: You're saying it's telling that he's threatened to declare an emergency but, so far, has not. CUELLAR: Yeah. I mean, if it's an emergency, he would've declared it already. And by the way, listen; the border crime rate - murder, rapes, assault - is lower than the national crime rate. In fact, my hometown of Laredo is about three, four times safer for 100,000 individuals than Washington. The most dangerous thing I do on the border is when I leave the border, come to Washington, D.C., because it's so dangerous here. And again, I'm not talking about the politics. I'm talking about FBI stats. So I mean, you know, when they talk about the crisis, what crisis are you really talking about? 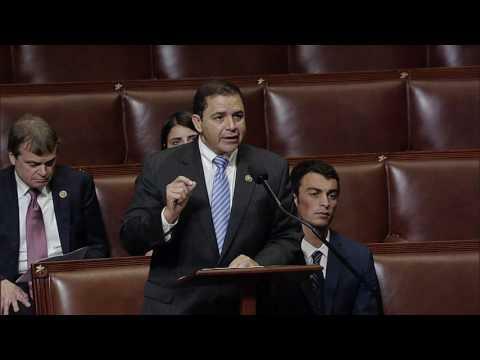 KELLY: Henry Cuellar - he is a Democratic congressman from Texas. Thank you so much, Congressman, for taking the time. CUELLAR: Thank you. Transcript provided by NPR, Copyright NPR. The Southwest Workers Union and members of the San Antonio community gathered Friday to protest Fox News’ “Battle at the Border,” a town hall event centered on border security and immigration issues. TPR's Carson Frame spoke with protesters outside Fox News' "Battle at the Border" event.